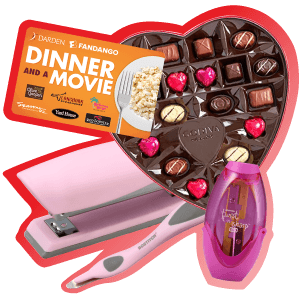 Win a date night on us + some adorable pink supplies! Enter now through Tuesday 2/12 to win + get your prize in time for the most romantic day of the year. Thank you for your interest. The sweepstakes period has ended. 1. Eligibility: Sweepstakes (the "Sweepstakes") is open only to those who sign up at the online sweepstakes page and who are at least 18+ years old at the time of entry. The sweepstakes is open to the legal residents of the United States and is void where prohibited by law. Employees of Amax Inc. (the "Sponsor") their respective affiliates, subsidiaries, advertising and promotion agencies, suppliers and their immediate family members and/or those living in the same household of each are not eligible to participate in the Sweepstakes. The Sweepstakes is subject to all applicable federal, state and local laws and regulations. Void where prohibited. 2. Agreement to Rules: By participating, you agree to be fully unconditionally bound by these Rules, and you represent and warrant that you meet the eligibility requirements set forth herein. In addition, you agree to accept the decisions of Amax Inc., as final and binding as it relates to the content. The Sweepstakes is subject to all applicable federal, state and local laws. 3. Sweepstakes Period: Entries will be accepted online starting on or about Feb 8, 2019 at 12:00 AM and ending Feb 12, 2019 at 11:59 PM. All online entries must be received by Feb 12, 2019 at 11:59 PM. All times are (GMT-05:00) Eastern Time (US & Canada).6. Odds: The odds of winning depend on the number of eligible entries received. By entering the Sweepstakes you agree to receive email newsletters periodical from Amax Inc and Bostitch Office. You can opt-out of receiving this communication at any time by clicking the unsubscribe link in the newsletter. Winner will be contacted by email on or about Feb 13, 2019. I would definitely take a date night with my hubby! Especially since we don't get much time to do so with 6 active children. If I won I would gift it to myself. Much needed me time. Thanks for the chance. Even singles need a Valentines/. I would love to win! I Have No Valentine & Im Going through Cancer.. I love the movies, and chocolate.. If I won I would keep it and use it. Thank you for the chance!